Your body is in neutral alignment when 1) your ears-shoulders-hips-knees-ankles all form a straight vertical line (like the dotted yellow line below) and 2) when your pelvis is stacked directly under the rib cage with those bony points in the front of your pelvis pointing straight ahead (like the solid yellow lines below). When your body is in neutral, your skeletal structures do the work of holding your body upright, thereby alleviating excess stress and tension from being placed on your muscles. When your body is out of neutral, such as in the images below — where the pelvis is tipped downward (left image) or tipped upward (right image) — this places excess tension and stress on your muscles, especially the core muscles. Unfortunately, another “fun” side effect of having a baby is that pregnancy pulls the body out of neutral. If you look at the photo below, it becomes easier to see how the growing belly (and breasts) pull the body out of neutral. Excessive Lower Back Arch: The growing belly tends to tilt the pelvis downward (like the image on the left up above), placing excess pressure on the lower back, abdominal wall, and pelvic floor muscles which therefore can increase the risk of lower back pain, diastasis recti, pelvic floor dysfunction and other pelvic girdle pain. Rounded shoulders: The weight of the growing breasts during pregnancy often pulls the shoulders forward into a rounded position, which can lead to upper back and neck pain. This is often exacerbated in the postpartum days with countless hours spent in a “triple-flexed” position (shoulders, elbows, wrists) feeding and holding baby. Shift in center of gravity: You may have heard that pregnant women are more susceptible to falls. 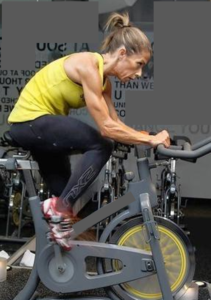 This is because the growing belly actually changes your center of gravity. 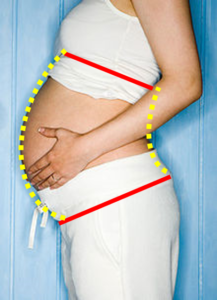 In a non-pregnant individual, the center of gravity lies just below the navel. However, during pregnancy, the growing belly shifts that center of gravity up and out. Combine this shift with the decreased stability that comes from the relaxin hormone, and it’s easy to see why the risk of falling increases. Do NOT let the pregnancy changes above cause you to panic! Once you’re aware of the common shifts, it becomes much easier to address them. Follow these simple three steps below to help you get — and stay — in neutral. 1. Find Neutral: Take a few moments to find neutral on your own body, and experience what that feels like just in a static (not moving position). Watch this video to learn how to find neutral. 3. Stay in Neutral in Your Daily Life: Even if you go to the gym for an hour and do everything in perfect form, how you move in the other 16+ hours in your day can have an even greater impact. Two movements to pay especially close attention to are your seated alignment and your bending over alignment. We name these two because of the amount of time most of us spend in these positions each day, and how common it is to perform them in poor alignment, like the photos below. These hunched over positions place excess stress on the core muscles. 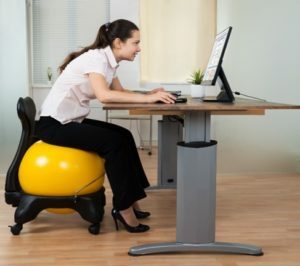 On top of that, sitting in a slouched position shuts off the critical deep core (or core canister) muscles. To practice proper seated posture, sit tall in your chair with your feet flat on the floor, and try to create that vertical line from ears-shoulders-hips. Another way to think of it is to try to get the bottom of your rib cage in a vertical line with your hip bones. To practice proper bending over technique, practice this simple Ground Pickup movement, which teaches you how to hinge from your hips, instead of reaching with your arms, when bending over. Once you master proper form, you can increase the weight you lift. Want more help? If you’re in the New York City area, consider working with one of our in-home personal trainers, or attending one of our classes. If you’re outside the area, check our Find a Professional page to see if there’s a PROnatal Certified Professional near you.